When Clive and Ian Sinclair designed the $99 computer, the world was truly amazed. Sometimes lightning does strike twice, because they've done it again, with a $99 printer. As you would expect from Timex, the company that markets Sinclair's computer in America, this printer is small, inexpensive, and works perfectly when you take it out of the box. What will the Timex/Sinclair 2040 Printer do? First of all, you can make a printed copy of your own BASIC programs. This can save you hours of trying to read your program off the TV screen, no easy task since the screen can handle only 22 lines at a time. 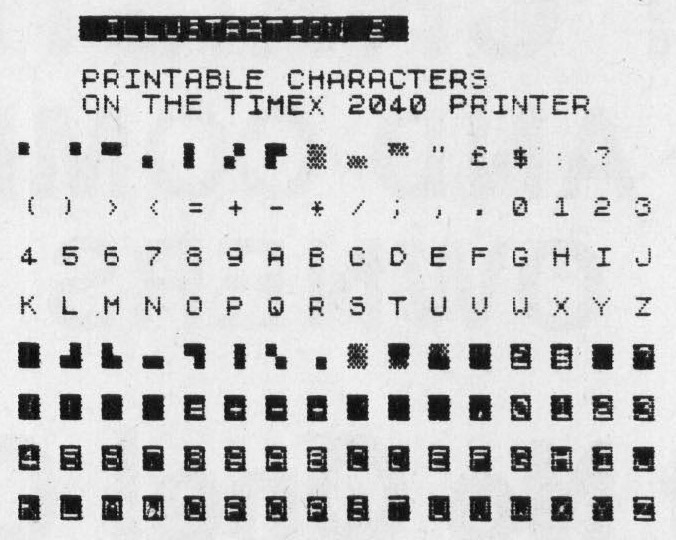 Second, if you have created a picture on your screen with Timex/Sinclair's graphics, you can make a copy of that picture on the printed page. Third, it will print individual characters on the page, for simple word processing programs. The 2040 is a particular kind of dot matrix printer. Each letter is printed by little wires that move, creating the letters by electrical charges that "burn" holes in a special paper. Each letter is made from a grid of dots, eight dots high and eight dots wide. The line length of the printed page is 32 characters across. After unpacking the printer, all you have to do is plug the printer cable into the back of the computer. If you have a RAM pack, you can plug the cable in between the computer and the RAM pack. The printer comes with its own 24-volt power supply, which plugs into any 110-volt wall socket. Be careful, however, when connecting the printer. If you plug in the printer while the computer is on, the sudden rush of electricity could overload one of the integrated circuits. Also, if you attempt to print anything before you load the paper, it could damage the printing mechanism. The printer has simple controls – an ON key and an OFF key. You can also test the printer by pressing the OFF button while pressing the ON button. If the printer is working correctly, it will print rows of 1's and 8's until you stop it by pressing OFF again. Furthermore, you can advance the paper by pressing ON, if the printer is already ON. Unfortunately, the printer does not have a light to warn you when the power switch is on. The motor heats up a great deal, and if the printer is left on a long time, it may wear out some of the components. Using the printer is easy. You can use three special commands already built into Timex/Sinclair BASIC: COPY, LLIST, and LPRINT. COPY is used to transfer whatever is on the computer screen to the printer. You may type it directly (by pressing the Z key) or it may be part of a program. 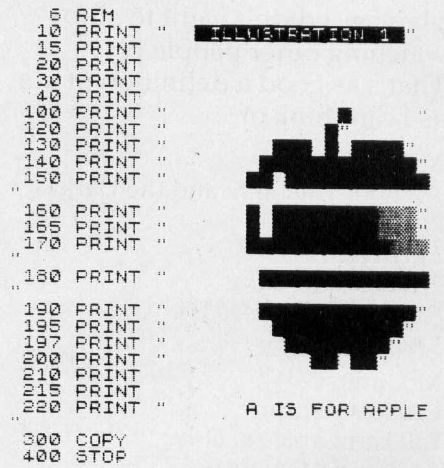 The figure shows what a digitized apple looks like on the printer. The picture was first "printed" on the screen (using the PRINT command) and then copied to the printer using the COPY command. That apple was printed by using inverse spaces (Graphics key and Space) and shaded squares (Graphics key and Shift H). If you look closely, you will notice that the tiny squares that make up the picture, such as the top of the apple stem, are not exactly square. You can also see the individual wire tracks across the picture. However, for $99, this is quite acceptable. The person who buys a Timex/Sinclair computer is not likely to want to spend $1000 for a high-resolution dot matrix printer. Here is the program that was used to print the apple picture to the TV screen. We can make a copy of the program (listing) by typing LIST (Shift G). LLIST will print out whatever BASIC program is currently in memory. If you have a long program, it will print out the whole thing in one long roll. Suppose you have a different application, say a simple word processor. You can use the LPRINT command to print individual letters on the printer. The computer waits until the entire line is ready, and then it prints your line. 8 LPRINT " ON THE TIMEX 2040 PRINTER"
This program is fairly simple. The only odd part is in lines 1020 and 1040. Since the Timex/Sinclair stores all its BASIC commands as single numbers, we want to make sure that those commands (RUN, GOTO, etc.) are not printed. We already know what their letters look like. The Timex/Sinclair printer is relatively fast, printing at a rate of 50 to 80 characters per second. It will COPY a full 24-line screen to the printer in less than 11 seconds. It is much quieter than most dot matrix printers, making a whirring noise not much louder than a tape recorder rewinding. This printer will be greeted with enthusiasm by serious Timex/Sinclair computer users. Writing programs without being able to print out listings has been a problem, since you could only view 22 lines of your program at a time. In a very long program, it seemed to take hours to find a particular line. Also, being able to print out the unique graphics of the Timex/Sinclair is a plus. An earlier version has been available in England for quite some time, but the new 2040 has been changed to work with American voltages and it uses a better grade of thermal paper. Once again, Sinclair is to be congratulated for inventing something smaller and less expensive than anyone else. Timex is to be congratulated for bringing it to America, and for energetically supporting their products. This printer fits in well with the Timex/Sinclair philosophy – it does the job without frills and without great expense to the consumer.